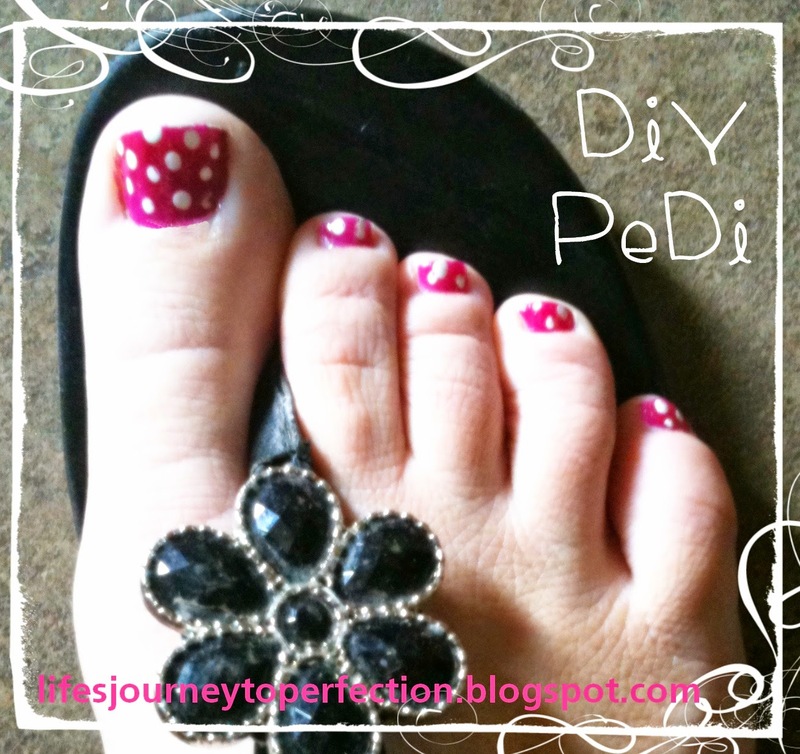 Doing your own pedicure is super thrifty! All you need is a foot file, some nice moisturizer, a cuticle tool, nail clippers, and some finger nail polish. All of which can be bought at the dollar store. First, use the foot file and file all of the rough spots on your foot. Next clip your toe nails. I actually have a toe nail clipper that is a little bit larger than a normal clipper. Then, file your toe nails. Making them smooth and the shape you desire. It is best when filing to file in one direction, not back and forth. Next, apply your moisturizer, give your foot a nice massage, pay attention to massaging the moisturizer into your cuticles. Then gently push back your cuticles with the cuticle tool. Wipe off your toe nails and apply your base polish. I did two coats. Then you will pick another color, I did white. I used the end of my cuticle tool to make the dots, you could also use the end of a strait pin, craft paint brush or an embossing tool. Actually I've also used the end of a bobby pin before too. They make dotting tools if you would prefer to purchase one. Then you will make the dots, by dipping your tool into the nail polish and dotting it onto the nail. As you can tell it is my first time doing the dots, they are not too uniform and my little toes they are a little crowded. Next time I will do it a little different then just randomly putting them on. I've seen a tutorial that has you put a dot in each of the four corners and one in the middle then you can evenly space them in there. Wait for the dots to dry and then put on a clear top coat. And there you have it some cute toe nails to show off your favorite sandals.